Sheriff Ross Mirkarimi and his wife, Eliana Lopez, are now allowed to be together, with a judge granting a modified court order in the case. Days of testimony in hearings before the San Francisco Ethics Commission about his suspension have led to the lifting of a stay-away order for Sheriff Ross Mirkarimi and his wife, Eliana Lopez. The couple kissed outside the courtroom, telling reporters it was the first time they've been allowed to hold hands since January 13. The new court order is in place, stating Mirkarimi cannot harass, strike, threaten or assault his wife. The couple has a young son who is now staying in Lopez' native Venezuela. They both said their first move as a reunited couple would be to call the boy. Lopez testified that she never said her husband was a powerful man -- and he did not shout during the Dec. 31 argument that led to him grabbing her arm, leaving a bruise that suspended him from office, Lopez said Wednesday during public testimony. Lopez, 36, a Venezuelan actress, has been testifying all week before the San Francisco Ethics Commission in her husband's removal proceedings. Lopez has been in her native Venezuela since March, when Mayor Ed Lee suspended Mirkarimi without pay for official misconduct, and began proceedings to remove him from office. 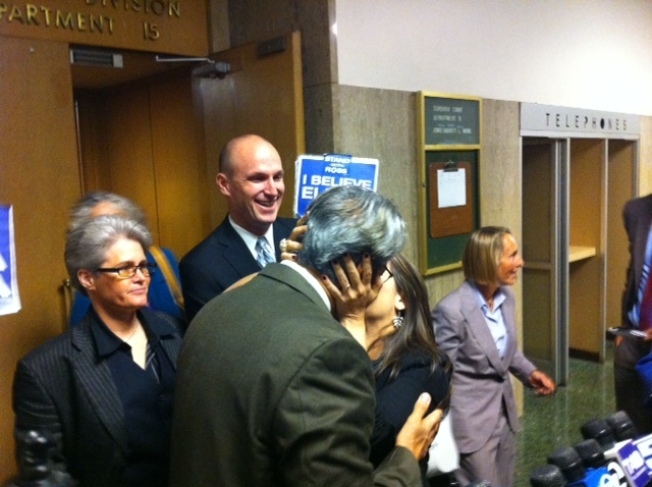 Mirkarimi pleaded guilty to falsely imprisoning his wife, and admitted he grabbed her arm during an argument. Lopez has been steadfast in supporting her husband, and called the removal proceedings politically motivated. -- Chris Roberts contributed to this report.